Open source is really good at creating products. Almost any commercial software package or product like Word, Excel, Windows, or Photoshop has a great open source equivalent. 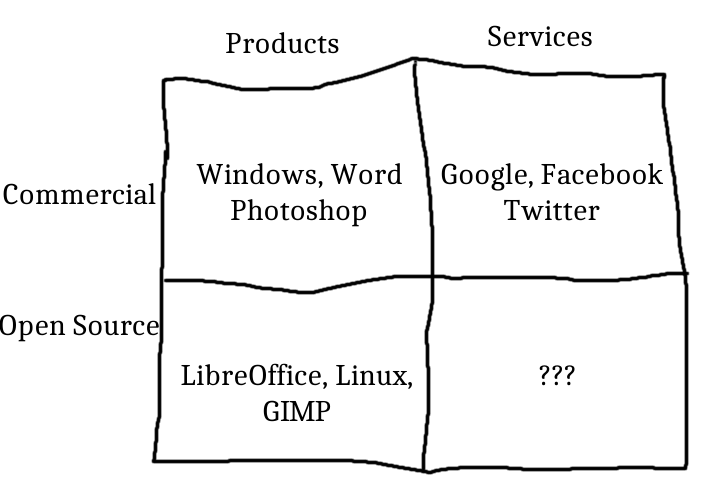 However, open source has been less successful at creating services. Where’s the open source version of Google, or Facebook, or Twitter, or Gmail, or Craigslist? Now to be fair, the bottom-right box isn’t completely empty. There’s Wikipedia, which is a phenomenal service/website supported by donations. There’s Tor, where many companies and people volunteer to run relays and bridges. There’s BOINC, which is the open source software used by volunteers for SETI@home and Folding@home. There’s also OpenStreetMap, which is a wonderful resource. But why aren’t there more open source services? Let’s run down some differences between products and services. With open source products, it can take a lot of work to create something great like Linux or Firefox, but then everyone can download that product and use it immediately–there’s no extra cost for the producer or the consumer, other than maybe a bit of bandwidth for downloading. Once a product is done, it’s often done–frozen until the next major update. A product might take a year or more to reach a milestone, but it can often be used for years after that. In contrast, services may change from week to week, which implies strong product leadership to determine priorities. If you download a copy of LibreOffice, you might write some unpleasant things or even hate speech, but that doesn’t hurt LibreOffice itself. However, if someone sets up a “free as in beer” translation API or geocoding API, you often see multiple levels of abuse. For example, some people might use a service so much that it overloads the service provider. Or people might scrape the translation API in an attempt to generate spammy text in lots of different languages. When you offer a product, potential abuse is usually less of an issue. Products don’t have to be perfect; often “free as in beer” is enough of a feature that someone will use GIMP as opposed to paying for Photoshop. But user experience and speed do matter, and commercial services have a strong incentive to nail both of those issues. It takes a ton of work to be fast, for example. Commercial services are often “free as in beer” as well as fast and pleasant to use. Thanks for staying with me so far, because I think this is the most important difference. I believe what might be missing is a good funding model for open source services. With a finished product, if you can find someone to donate bandwidth for downloading and maybe a simple website, you’re close to done. But with a service, there’s typically an ongoing cost involved with every API call. For something like web search, there can be a lot of processing work going on behind the scenes. So what are the major funding models that might support an open source service? Right now, I can think of ads, occasional pledge drives, grants, subscriptions, or micropayments. From that list, my guess is that ads are the least appropriate. If ads are easily separated or can be blocked, then you might get a “free rider” problem where someone could take your service, remove all the ads, and offer it up as their free service. Personally I think advertising can be incredibly useful and responsive to a user’s needs, but some other individuals dislike ads. Ads can be the foundation of a freemium or hybrid approach; for example, I think Automattic offers free blogging on WordPress.com and funds itself partly through ads. Regarding pledge drives, Wikipedia is a notable success, but it’s a lot of work on both the producer side and the user side, much like public radio (by the way, you can donate to Wikipedia here). Grants can work well, but grants tend to end after a few years, so they aren’t a complete solution to sustainability. That leads me toward subscriptions or micropayments. I’m excited to see some movement in this area. Patreon lets you support your favorite creators and does at least a couple smart things. First, they only take 5% of donations. That puts them in the “doing it for the love” category. Patreon can be beloved while still making some money ($1M in donations each month * 5% cut * 12 months means >$600K/year). Second, they attempt to minimize payment fees by charging only once a month for all the people you support. So if you’re supporting four creators, then the credit card charges are split four ways. The first move is brilliant, and the second is very smart. Bitcoin is another possibility for micropayments, although it’s still early days for that. I’m also excited to see Google Contributor launch. The idea is that a user contributes a certain donation each month. As the user surfs around a participating site, they don’t see ads on that site, but the site still gets paid from the user’s contribution. Ultimately, I don’t know how to foster more open source services. I just know that I want them. In the same way that Firefox pushed Internet Explorer to improve or Apache pushed IIS, I personally would like having an open source search engine to push Google as well. Wikia Search was an attempt at that, but it didn’t get much traction. Maybe the answer isn’t funding. In a recent talk, Melody Kramer floated the idea that people could support public radio in *tons* of different ways like volunteering their time or experience, not just with money. Maybe we need better ways for companies or regular people to volunteer their CPU, storage, or bandwidth. If we all kicked in 10% of our free disk space, could we come up with open source versions of Dropbox, Box, or Google Drive? So I don’t have the answer. I just think it’s an interesting and perhaps an important problem. Do you agree? How would you foster more open source services? I think you might drive some deeper thoughts from people if you maybe edit the post to include a definition of what a product is vs. what a service is. i say this because I wouldn’t consider Fb, Twitter and Google to be services. They’re products aren’t they? People can rent out spare storage space in exchange for “safecoin” cryptocurrency. It is envisioned that developers will be able to code apps for the SAFEnet and be paid in safecoins; the more popular the app, the more they earn. john, I don’t think DuckDuckGo is open source? Their Instant Answers code looks like open source, but I believe the core code is proprietary. Google would fit into both product and service depending on what aspect your talking about. Most general users would only see the product of Google’s efforts such as search, Gmail or Google+. Many wouldn’t realise that Google provide some of the richest APIs to interact with their services, allowing third parties to build on top of or leverage their existing work. I appreciate the sentiment behind wanting more open source services in general, that would be a wonderful place indeed. With respect to an open source Google search, that isn’t likely to happen anytime soon. Assuming you could amass the engineering talent in an open source manner and build a competitive product (even a niche, competitor product to one aspect of Google’s existing arsenal) – you’ve still got the near impossible battle of marketing the product, convincing users to change their habit of using Google and ultimately gaining traction. Consider what has happened in more than a decade since Google was founded, the industry went from having more search engines than users could remember and through superior services – they’ve lost the battle to Google and others along the way. In most parts of the world, Google has the majority market share and competitors like Bing probably don’t even rate as a true competitor* in Google’s eyes anymore. In that time we’ve also seen start up search engines, with serious funding and engineering talent like Cuil, come and go as an after thought. Knowing what you know from working inside Google for so long and understanding the enormous amount of effort it takes to make Google as a company, product and service run – how do you think, in all brutal honestly, an open source or start up search engine could compete against Google in the current environment? What would be your USP, what do you consider a clear failing or opportunity in the market place that a start up could have a serious attempt at? * I really do welcome the recent and substantial improvements that Microsoft have been making to Bing, it actually feels like they’re really trying to compete for the first time in a long time. I don’t see how anyone could offer an open source alternative to a search engine that would be successful and/or scalable. The nature of “SEOs” and other manipulators necessarily requires a search engine to be closed source. I’d say the same thing about FB/Twitter…the spammers would outdo the people working on the project. Mind you, a lot of clone scripts have been written for FB/Twitter/Craigslist/Yipit/Dealfinder/etc. There’s even a firm from India called Agriya…find them yourselves, because I refuse to send them any traffic…that creates clone scripts of major websites. The other problem with the argument is that merely making an application open source does not in itself make it an equally viable alternative. There are other aspects to a site that are not related to code but add value to the site. Let’s use Google as a very practical example. You guys have some smart, yet accessible employees such as yourself and Jason in the DoubleClick division who used to help host the Google conferences a couple of years back (sorry, I can’t remember his last name). You can’t duplicate that just by building an open source alternative…you need the people involved with both the brains and the social skills. In other words, the things that make a major website great make it closed source both by necessity and by design. Isn’t DMOZ an Open Source ‘Service’? alebit that it seems to be like a private members club and nothing like as ‘open’ as say Wikipedia is… Isn’t there also a new Social network service that has just started (name escapes me) where you get in by invite only – and it isn’t a commercial enterprise? Funding is the elephant in the room and why Gimp and OO lag badly behind for pro or semi pro use – for the same reson that worker coops find it hard to get going in any industry that has eaven trivial capital requirements. Micropayments has been the next big thing in 5 years just like AI and Fusion have been for the last 5 decades I am not holding my breath. Regarding “Micropayments has been the next big thing in 5 years,” I remember when all of Google’s mobile efforts were half of one software engineer. This was the days of WAP, and things continued like that for years–until they didn’t. A “true” micropayment system might still be far off, but one-time charges once a month help to reduce the overhead involved with such a system. Great post, Matt. I have been thinking a lot lately about the concept of open sourcing “services” as a means of evolving frozen/ stuck-in-the past industries. Pulling-back the lens a bit to broaden the landscape, would you count something like Uber as “open sourcing” the taxi industry, for example? I’d view something like Uber as making transportation much more efficient, but personally I wouldn’t consider it open source–much of the value that gets created goes to Uber and Uber’s drivers. Unlike product, services require very high operating expenses like API Call, Computations, Bandwidth and other kinds of opex/labour. Even the most complex product is high on capex and inital labour and but low on opex/ongoing labour but services aren’t like that. And bitcoin does exactly that and that is why its the first truly open source service against the competing commercial services like Western Union, Paypal etc. This is an approach that one of my friend, Matan Field’s startup Lazooz has taken. I think coming up with open source versions of commercial software or services will lead to more failure than success. The key issues are funding and expertise. If the current companies have social side projects which will then be given up to OSS leaving it to the expert community for maintenance and having pledges grants fund the the product or sevice. Indeed, WordPress is open source and offers up something called the “native theme” to devlopers… And then you have the frameworks like Genesis on top of that. It’s a fascinating time for software. Open source is like playing with Legos: the instructions are available but not vital. Using Known, you publish your content to your own site. As well as being able to communicate with other Known sites, you can syndicate your content to existing social networks like Twitter and Facebook. That way you can still participate in those ecosystems, while remaining in control of your content. Very shortly, you’ll be able to follow other users (whether they’re on Known, WordPress, or elsewhere) and read their content from an inline stream, just like you can on social media. It all uses open web standards, and it’s easy to write software that works interoperably with it. We do also have a hosted service, which we’re supporting through revenue, particularly through the higher education community. The wonderful thing about open source business models is that your users become co-developers in a very real way. Over time you build a community of real collaborators. Open source is like a double-edged sword. I’m thinking of it in terms of Wikipedia. On one side, we get great, informative content. One the other, it’s also a platform for abusers and spammers. And so the question that hangs in the air for future open source services is: can it be trusted? I’d argue that Bitcoin and the Blockchain are the first true examples of an open source service because it has an economic incentive of funding model built in. You provide examples of OpenStreetMap, Tor, and BOINC. OpenStreetMap’s hosting is dependent on the continued support of its partners, which is not guaranteed. Tor is close, but there is no ongoing economic incentive for network participants to continue to operate relays. In order for a service to flourish there has to be some way for participants behind it to pay their bills. I think the reality is that it is in fact early days for open source as a service. I think it is possible to build an awesome business around Open Source. We built WakaTime – which is analytics for programmers. We have open source plugins for text editors (15 and increasing) and they talk to the WakaTime API and it’s a fremium product. For people who want reports longer than a week, we charge. So far it has been well received by customers. We have benefitted by being open source because we tapped into a community that resonated with us. We even get help with development from time to time! Would you count the likes of Opencart, Prestashop etc as open source services as their commercial equivalent would be Shopify etc? These can be a God send for small business wishing to sell their wares online.